Both kittens have lovely jet black, well defined inky spots just like their mum (see the last photo for Mum and Dad) Kittens will be brought up in our family home, very well socialized and used to children. Non-refundable deposit to reserve. 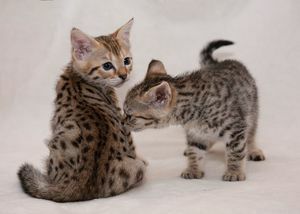 Kittens will be TICA registered, fully vaccinated, flead and wormed.